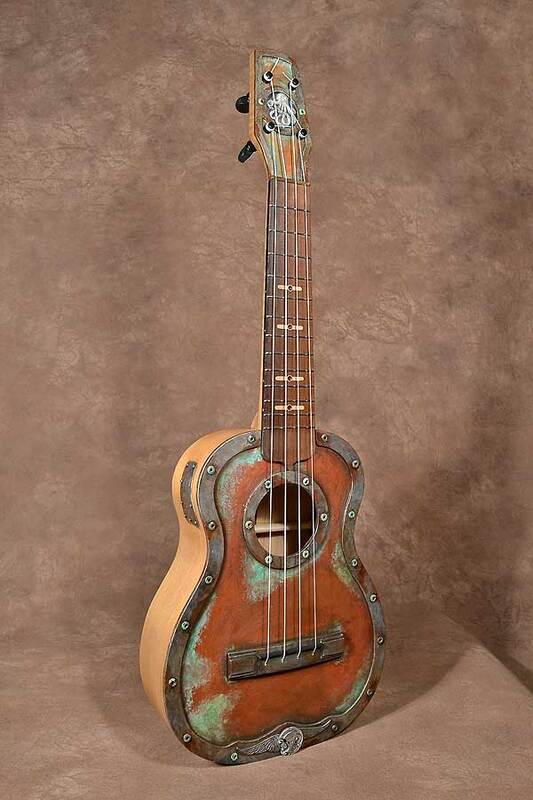 This concert size ukulele was fabricated in the steampunk fashion of art. Steampunk art is a fun style where elements that never should meet are placed together to make an unheard of creation. This particular instrument despite how it looks is an all wood (mostly) very high quality, very playable instrument. The heart of the instrument; the soundboard is Western Red cedar that has been faux finished to look like aged copper and the edging appears like rusty steel, is pearwood. To achieve this finish the instrument is initially finished in lacquer and then a thin acrylic layer is painted on and sanded flat. The artist Robin Cooper is a professional faux finisher who has done work in Disneyland and on some of your favorite Pixar films. Her painting is then sealed with more lacquer coats. The sides of the instrument are as smooth as a ‘normal’ instrument would be but the painted finishes are a little rougher than normal. Importantly they are protected from wear and they look great. Her effects are very convincing. The Copper rivets around the edges are metal as is the watch and wings medallion at the base of the instrument. The ‘repair patches’ are really parts of the sides and back. A little carved detail, paint and real screws make them look real. Like any other Pohaku ukulele this ukulele plays well and sounds good. It has good volume and depth and accurate intonation. Some weight and performance are out of necessity compromised for the styling cues that I’ve added but as these are such responsive instruments in the first place it still probably sounds better than most any other instrument on the planet and elsewhere. There's not another one like it anywhere! Overall length is about 23” and weight is approximately 18 ozs. The instrument comes in a hardshell case. Price is $1,600 + shipping + tax in the state of California.